I was grouchy. And we all know that grouchy mama = grouchy household. Weaning, yet no slowdown in night wakings, plus travel the previous weekend, plus the endless cycle of chores and what I needed was to breathe and move. Yoga would be perfection. A nice, solid hour of breathing and stretching, moving into poses that were challenging but attainable. Yoga is like a drug and I needed it. I need it almost daily, actually. And here is the conundrum: how do I get in a decent practice with a barnacle who is not yet walking, and certainly not yet talking, but who likes to be on mama as much as possible? I am not the only one who faced this hiccup in her yoga practice. Step 2: Accept cuddles…and turn them into a ride. Step 3: Allow yourself to become what your child needs. At one point while I was in downward dog, he needed my arms and shoulders to be a mountain for his car. Step 4: Encourage movement. Your are your child’s best example and cheerleader. If you invite him, he will follow. Step 5: Pause. He needs to be right there, and you need to take a few more deep breaths before leaning forward into crow. Step 6: Make silly faces. This is group practice, after all. Step 7: Pause together. Applaud every effort. Also, be flexible in your practice. Child’s pose was not part of this sequence, but he moved into it and smiled invitingly. Who am I to deny that? And if the sequence takes five or ten more minutes, well that’s just five or ten minutes more of yoga that I get to enjoy. Step 8: Relax. It’s just yoga. It’s just a few moments in time. Breathe, and enjoy the feeling of little hands and knees and cars and kisses. So that’s it: 8 steps to Yoga with your not-quite toddler. Embrace the crumbs. The sequence I did was from Yoga Journal, and can be found here. I also like the free session at Yoga Today, which changes weekly. For a nominal fee, you can also subscribe and purchase downloadable hour-long practices. GREAT for those of us with limited childcare options. If you have a younger child, this a is a nice video for easing gas and colic, and my son LOVED stretching over my yoga ball. If you have an older child, here’s a nice photo series for a sequence. 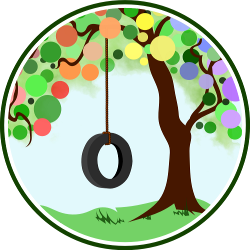 Finally, a few resources for healthful family life can be found here. I love it! Since having my son, who is one, I have focused mainly on finding time for me to practice yoga. While I don’t want to give that up, I think I will try this too. Thanks, this is very exciting! My personal favorite is the face. Fantastic. I’ve been doing my yoga before my son wakes up – maybe that’s a mistake. I’ll try including him tomorrow morning. I bet he’ll like it. my son LOVES the hand shaking part. This is wonderful! We have a set of picture yoga cards at home that we all sit around & practice from. It may not always be a serene experience, but it’s a learning and connecting one! I have a set of those cards on my wishlist – and there are little figurines in yoga poses that I’ve got my eye on as well. 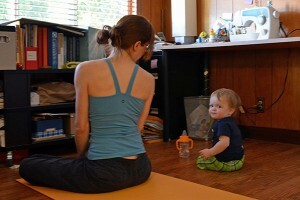 I feel that when he’s a little older it can be a way for him to “lead” our yoga session.